Liberal arts & fine arts —a match made in heaven. Christendom’s liberal arts experience is rich in the fine arts as well. From the beauty of our choir that can be heard in Christ the King Chapel to the dramatic talent that sets the stage aglow each semester, Catholic culture thrives here. 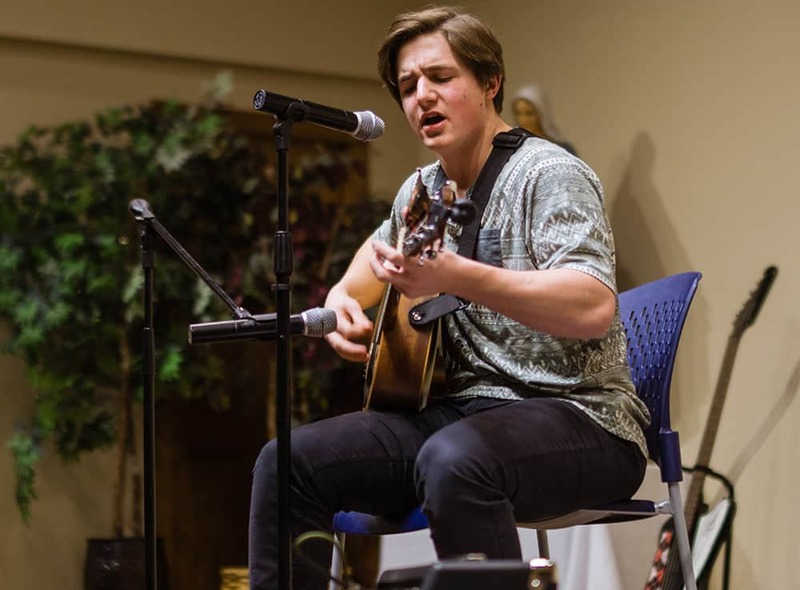 Aside from formal events and student organizations, the Student Activities Calendar is loaded with events that give students the opportunity to showcase their musical and dramatic talent – from the violins heard at St. Cecilia’s Night to the humorous skits seen at Coffee House. The College celebrates the Divine Liturgy with all due splendor. Part of this effort naturally includes the cultivation of the “treasury of sacred music” whose integral parts include Gregorian chant and the sacred vocal polyphony of great Catholic masters such as Palestrina, Victoria, and Josquin des Prez. 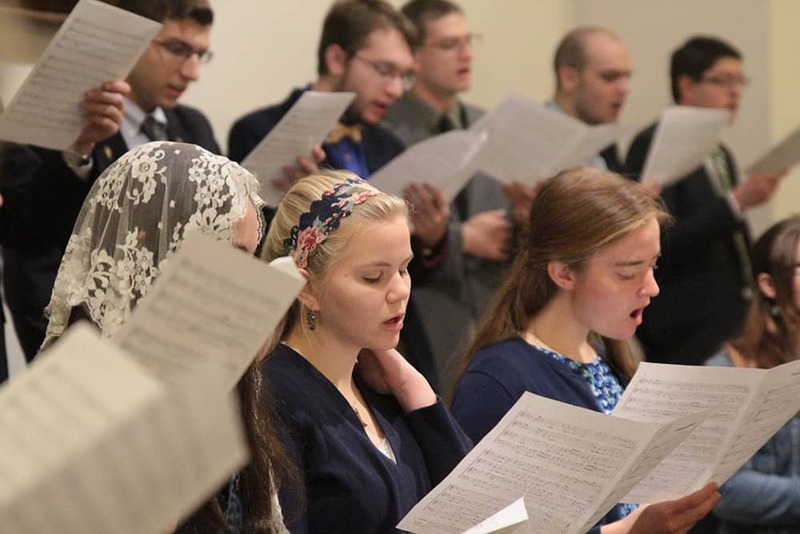 This sacred music is performed by students who sing in the Christendom Choir and Schola Gregoriana. By participation in a Mass so ornamented and elevating, the Christendom student is able to experience Catholic culture at its best. Using iTunes you can download their albums in the iTunes Store for FREE! 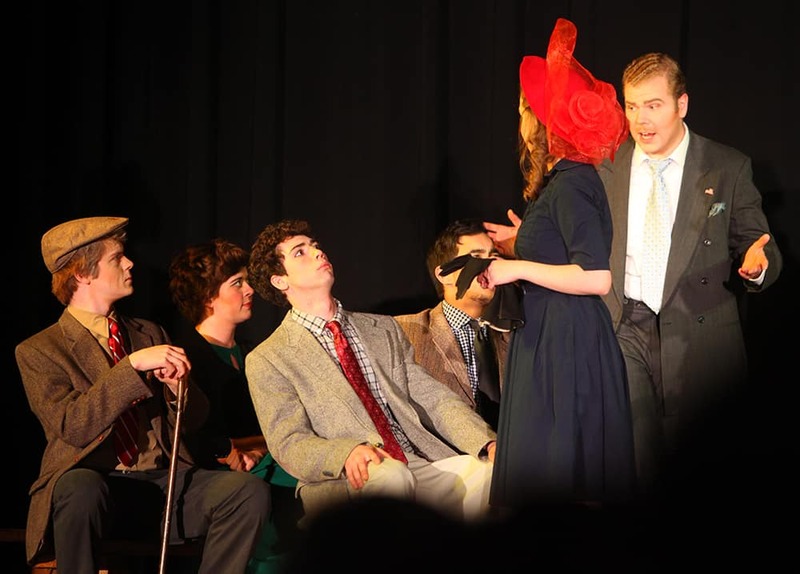 The Christendom Players, a student group of amateur actors and actresses, who are led by Literature Professor Dr. Patrick Keats, stages two productions for the entertainment of the College and the wider community each year. Past productions have included Shakespeare’s A Midsummer Night’s Dream, Oscar Wilde’s The Importance of Being Earnest and Lady Windermere’s Fan, G.B. Shaw’s St. Joan and Pygmalion, the Broadway Musical Hello Dolly!, the suspenseful Witness for the Prosecution, and the amusing Here Comes Mr. Jordan. 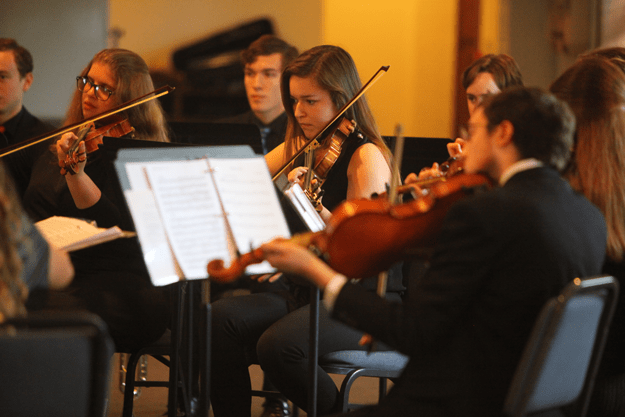 The Crusader Chamber Orchestra allows students to exercise and develop their musical talents through regular rehearsals and concerts. Repertoire ranges from music for full orchestra to winds-only and strings-only compositions. All prospective students are welcome to join. Find out more here! The Beato Fra Angelico Fine Arts Program offers our students a further opportunity to experience directly the higher and more aesthetically praiseworthy aspects of Western civilization and our contemporary culture through live performances, lectures, art exhibitions, and other on-campus events throughout the academic year. This minor, which is administered by the undergraduate Department of Theology, requires eighteen (18) hours of study after completing a departmental test or by successful completion of MUS 101-102 (A-Modern, B-Chant). Go here to find out more about the Music Minor. For the many, serious student pianists on campus, a Boston 7’10” grand piano, housed in a 400 square foot specially constructed practice room, is available for practice and for informal performances. Other pianos are located across campus for more casual play. Rooms can be reserved for bands and musicians to practice in. Stages in the St. Lawrence Commons and the St. Kilian’s Cafe have hosted countless talented artists.